Airport Problems? Here are some possible solutions. 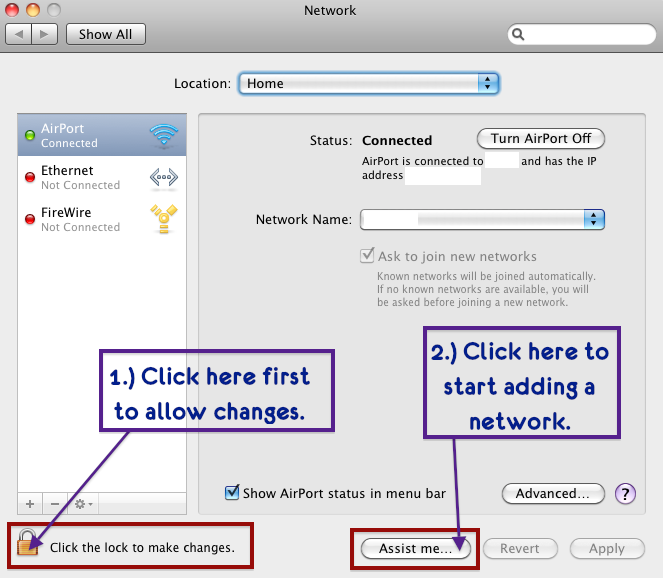 Recently I had a couple of problems with my Airport (or Mac wireless internet connection). So in case anyone else is having similar problems I will report my findings here. I was trying to connect to a new wireless network, which I had always found pretty straightforward to be honest. 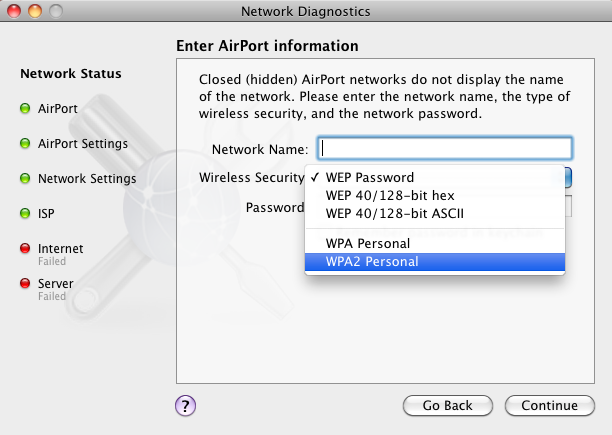 I had all the network names and passwords and knew whether it was WPA or WEP and so on. 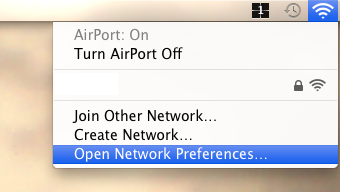 I also knew it was a closed network so it wouldn’t show up in the Select Airport Network window. My first mistake was adding a closed network as an ordinary network. My Mac couldn’t find the network at all. 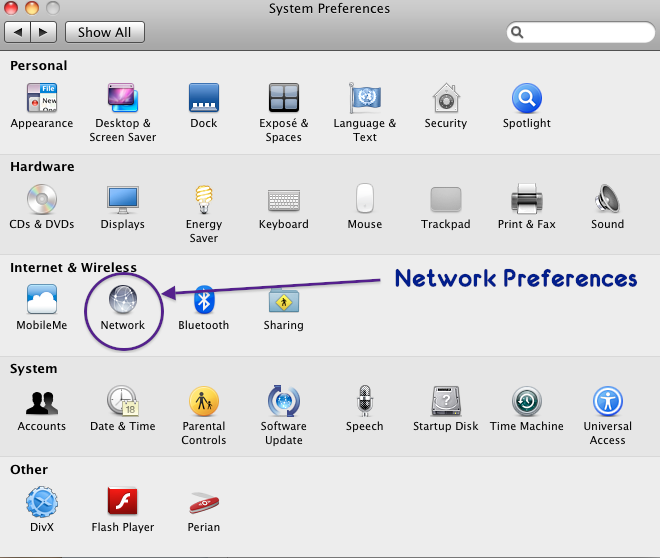 So Solution One: If you are using a private closed network help your Mac by adding the network as a closed network. 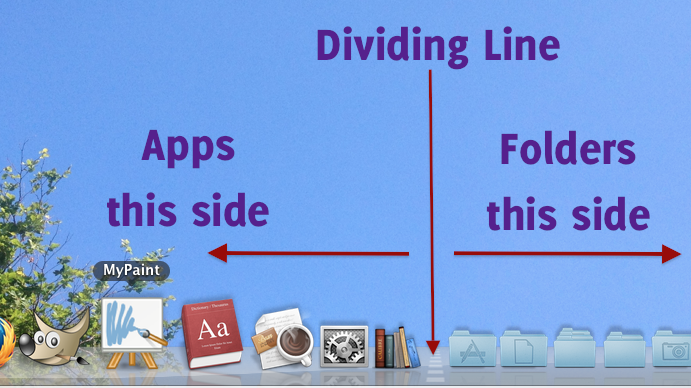 or using the Network icon in your toolbar. 2.) First click the lock in order to allow yourself to make changes. Unless you are Admin you will have to authenticate this. Then click the Assist me… button. 3.) You will be given the options Cancel, Diagnostics and Assistant in a drop down window. Choose Diagnostics. 4.) 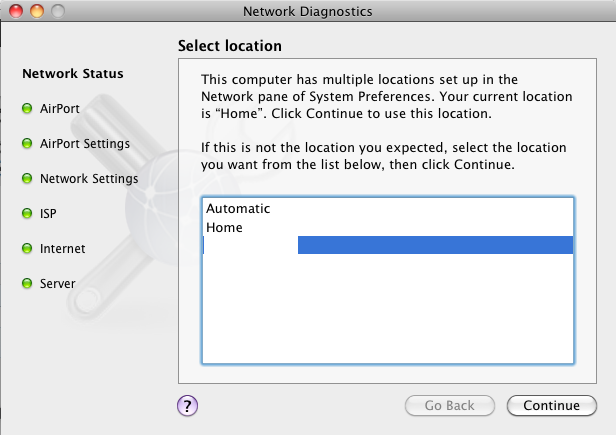 You are then asked to choose the Location of your network, e.g. Home, Work etc., then click Continue. 5.) 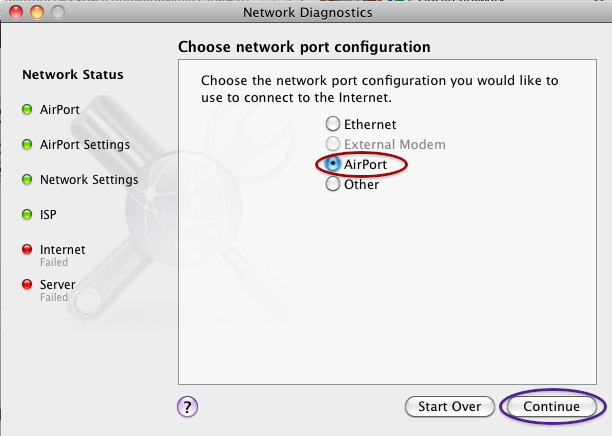 You are then asked to choose the type of network port (in general, Airport [wireless] or Ethernet [wired] ) you want to use. So for wireless choose Airport and then clickContinue. 6.) 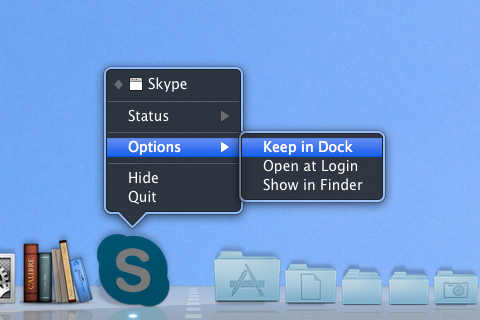 A closed network is private and therefore not visible in the available networks window. 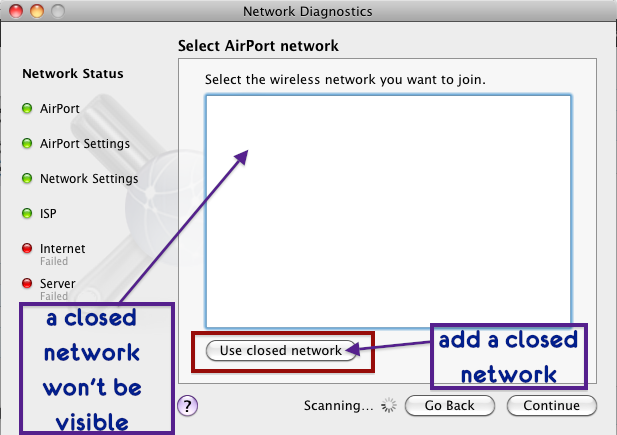 So instead choose Use Closed Network. 7.) In the next window you will be asked to write your Network Name, Wireless Security and your network Password. Ensure you know if there are any capital letters as network passwords are case sensitive. It is also important to know exactly what type of wireless security you are using (WPA, WEP etc.) otherwise you may not be able to connect even if the name and password are both correct. 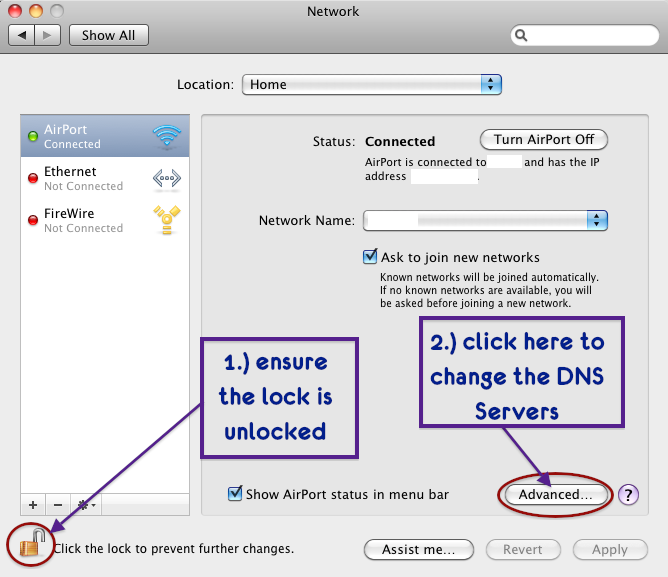 Your Airport should now be connected to your specified network. Airport Connected but still no Internet Connection! So having done all of the above I had my Airport connection up and running. It told me I was connected to the network and could identify the IP address. However there was no internet access at all either through Firefox or through Safari. Ensure that your DNS (Domain Name Server) servers are correct. To find out exactly what your DNS servers are you should ring your ISP (Internet Service Provider). In very basic terms, your Internet Service Provider is the company you pay every month to provide you with your internet connection. For example, some big name ISPs are companies like AOL (global), Pacific Internet (Asia), Internode (Australia), Softbank (Japan), BT (UK), etc. For more information about ISPs have a look at the Wikipedia page below. Once you know what they are (usually there are 2 – a main server and a backup), check they are correct by going into Network Preferences and then clicking Advanced. You can see your current DNS servers under the DNS tab. 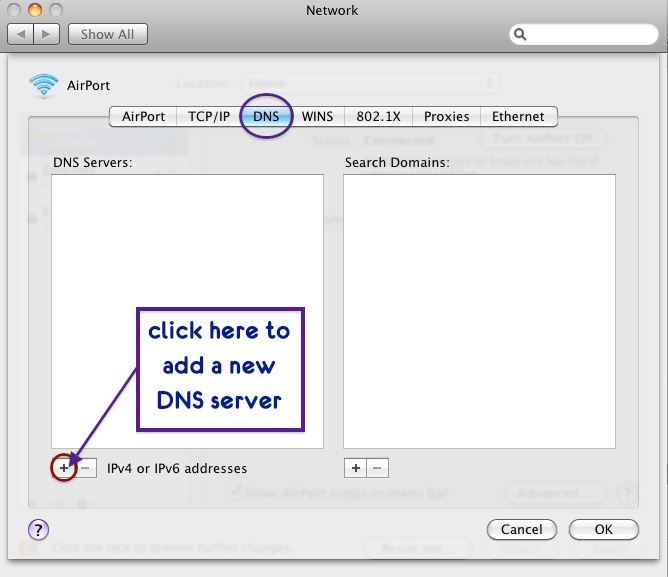 To add new DNS servers click the little + button at the bottom and type in the four sets of numbers. In some cases there may only be one server, but usually there are two. If your server is incorrect just add the correct server in the same way as adding a new server.